When a pedestrian is hit by a motorist, the ramifications are usually severe. For example, a pedestrian who was crossing near Alton Road and Sixth Street in Miami Beach died after being struck by a car, according to NBC Miami. The pedestrian died at the scene. Incurred Medical Bills: These costs include bills from the emergency room, ambulance, and immediate treatment after the wreck. Future Medical Bills: You can also seek reimbursement of future medical costs such as rehabilitation, physical therapy, surgery, prescription medications, and so forth. Lost Income: If your bodily injuries caused you to miss significant time from your job, you can pursue reimbursement for that lost income. Future Lost Earnings: If your bodily injuries are so severe as to leave you partially disabled or fully disabled, you can also seek reimbursement for future earnings you would have made had the accident never occurred. Pain, Suffering, Mental Anguish etc. : These are “non-economic” damages that are not easily calculable or fit neatly onto a spreadsheet. These are damages meant to compensate you for your stress, psychological trauma, anxiety, depression, and so forth. What If You Were Partly Responsible for Causing the Accident? 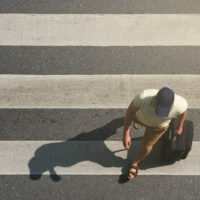 In some instances, there may be fault assignable to both a pedestrian and a motorist. If you find yourself in this situation, do not fret. Florida is a comparative negligence jurisdiction. This basically means a jury can assign fault on a percentage basis so the negligence is shared and your financial recovery is reduced (but not barred entirely). This is a much more equitable system than what is used in some other jurisdictions like Virginia, North Carolina, and Maryland that prohibits a plaintiff from obtaining a financial recovery if they were even just one percent at fault. If you suffered a serious injury after being hit by a motorist in Florida, it is important to take legal action sooner rather than later. You need someone to go to work for you to investigate the collision and build a persuasive case on your behalf. The Miami crosswalk accident injury lawyers at the office of Alan Goldfarb, P.A. are ready to help.